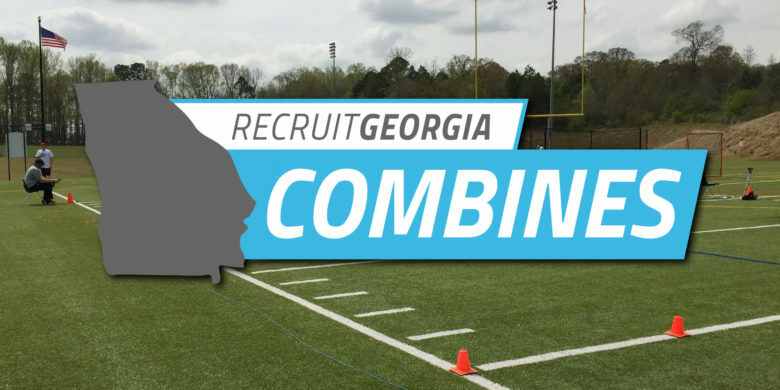 The clouds parted and sun peaked through for our Canton Combine last Sunday, which was the 5th stop for the Recruit Georgia Combine Series. Coming off the tail end of spring break, close to 30 athletes showed up to compete. One combine record was smashed, and just good numbers all around were scored by all of the athletes, so we broke down the top qualifiers at each drill and who ended up being the top dogs at each drills. At the bottom of the article, we’ll be posting who the combine MVP’s are too. 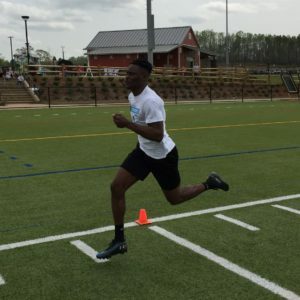 – The 2020 athlete from North Paulding has been clocked running a 10.8 100M this offseason and his wheels came out on top with his fastest time of 4.73 from our Canton Combine. The 2020 CB recruit has excellent speed, and very impressive at breaking on the pass. He needs more time in the weight room, but the 2020 North Paulding defender shows a lot of promise. He is slotted to get heavy reps his senior year and definitely a recruit to checkout this spring. Alleyne tested out as one of the more explosive players at the combine, scoring well on several drills. – Hopkins has legit height, and the 2020 jumbo-athlete from Lumpkin County tested out well at multiple areas, too. Just the week prior, he was tested out at 6’5″, so the point being, the 2020 recruit has good size and projects well as a D1 athlete. Hopkins played all over last year at offensive tackle, defensive end and even outside linebacker. He totaled a ton of QB hurries, and was one the precipice of making All-State on our site. A lot of schools are looking at Hopkins right now and will be visiting the rising senior this spring during practice. TOP DOGS: Stewart takes the top vertical spot with his 31.5″ leap. The 5’8″ 150 lbs defensive back tested out right in front of me, and explosiveness was evident even without knowing his score. Stewart was primarily a JV player last year, filling out his frame and working on hip quickness this offseason will get him ready for varsity play this fall. Just right behind there is a three way tie between Dirrim, Alleyne and Jace Bennett. TOP DOGS: Alleyne comes out top again with Stewart hot on his heels by just half an inch. The 2020 defensive back is clearly an athlete with good quick-twitch muscle with the drills he has excelled at. Stewart once again shows his upside heading into his junior year. Hopkins 9’4″ broad jump is certainly noteworthy for an athlete at 6’4″ and 230 lbs. 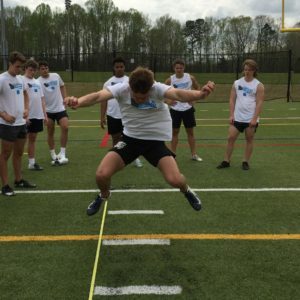 Among underclassmen, Mason Capers out of South Forsyth takes the top crown with a 9′ broad jump. TOP DOGS: Stewart ability to change directions bode well for a young cornerback. Scoring a 4.25 shuttle time ranks him in the top 5 percentile of all Recruit Georgia Combine Series participants. Finishing right behind again is Alleyne, and just as Stewart, his shuttle time is encouraging for a defensive back. Jace Bennett’s 4.33 continues to demonstrate that the rising junior from Banks County is a well-rounded athlete. Aidan Knight’s 4.33 shuttle time is very impressive for a 2022 player and looking at his 7’9.5″ reach, he should continue to grow. TOP DOGS: Dirrim’s 6.87 time ranks 2nd overall in the Recruit Georgia Combine Series, which has over 200 participants now. His L-Drill time is downright amazing, and shows that the impressive Creekview rising senior has the versatility to play all over the field. Stewart is once again right on the leaders heels with a 6.92, and that ranks him 3rd overall in the series as well. TOP DOGS: Hatcher, who is currently a freshman, just smashed the combine record which was both tied by Lane Ackles and TJ Parks on the same day. The class of 2022 defensive linemen from McEachern shows elite strength for his age, and with over 200 athletes participating this offseason so far, no one has been near 8 reps of Hatcher. Parks, a Cherokee rising senior interior linemen measured out at 272.2 lbs and a good 4.71 shuttle time. Lane Ackles, the little brother of a former sign-up, CJ, tested out with 22 reps. The new transfer from Bowdon is a compact athlete with several D1 offers to his name currently. Calhoun rising sophomore Mason Green’s 20 reps on the 185 lbs. bench would have broken the underclassmen combine record, but it was Hatcher’s day. Drake Hatcher – The class of 2022 defensive linemen’s 31 reps on the bench is pretty amazing. He claims a 370 lbs. bench max, which is the highest for any player his age that I have seen over the last 5 years of scouting the state. Hatcher was a standout at the Elite GA Classic game looking like one of the best freshman in the game. He shows elite football reactions coming off the line and plays the game with an undeniable motor. At 246.5 lbs., Hatcher will certainly continue to grow into his frame, and we expect him to fighting for reps this fall. 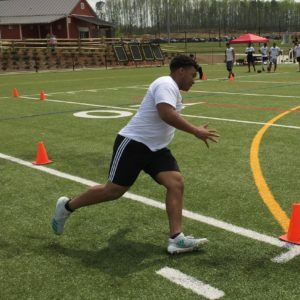 Mason Capers from South Forsyth is a rising sophomore who also tested out well with 4.88 40 time and his 9′ broad jump, which is eye catching for a 6’1″ athlete. Tyler Stevens, a 6′ 202 lbs. athlete from Creekview, had excellent scores of 4.26 on the shuttle, 7.21 on the L-Drill, and also a 4.86 40 time, which was the fastest of any class of 2022 athlete at the combine. The 2022 athlete is definitely a recruit to know. Mason Green from Calhoun and Aiden Knight both tested out in the top 5 at multiple drills, so a good day for the class of 2022. Noah Alleyne – At every drill Alleyne proves to be one of the best all-around athletes at the Canton Combine and really all of the series participants as a whole. The speedy North Paulding defensive back shows outstanding acceleration to the ball carrier and his impressive vertical should help with breaking up passes up top. North Paulding will be graduating several players from the defensive backfield this May, and I fully expect the rising senior to get a lot of reps. His 9’7″ broad jump and 4.73 40 times are top qualifiers for Alleyne at the event. Rising junior Nicklaus Stewart is right on Alleyne’s heels with excellent times at almost every drill, including the top vertical at 31.5″. Aaron Hopkins tested out with impressive scores, his 4.46 shuttle time and 9’4″ broad jump for a player his frame is eye-catching for sure. Jace Bennett from Banks County, Caleb Heintz from Cherokee and Lane Ackles also deserve some recognition too, but Alleyne’s explosiveness give us good expectations going into the 2019 season. Ethan Dirrim – This spot was very tight, but Dirrim’s all-around testing earns him the Overall MVP at the Canton Combine. Dirrim was measured out at as the 2nd tallest athlete at 6’1″, the 2nd fastest 40 time, vertical and his 6.87 L-Drill time would rank him high at the top of the 2019 NFL combine even. At 197.4 lbs., Dirrim is a well put together player who also ranked in the top 5 in the combine with 20 reps on the 185 bench. Last year, Dirrim played a large role in Creekview’s success where they were a consensus top 10 team for most of the season. The rising senior was a run-heavy QB who does a nice job of selling his mesh, and gets up field in a hurry to keep the chains moving. He’s developing as a passer, and made some tough throws in high-competition games last year, seeing him continue to improve in the pocket could really help with option schools going after Dirrim. He is also an intriguing wide receiver recruit or even an h-back if he continues to gain weight. Dirrim is one of the more dynamic players in Class 6-A, and certainly a good all-around athlete for the next level.